In California, is water from the north diverted into the Pacific Ocean? Possibly addressing the Californian wildfires, president Donald Trump claims that in California "water coming from the north" is "being diverted into the Pacific Ocean". Finding a list of rivers of California is pretty easy. The accompanying map shows that while not strictly from the north, a lot of rivers in California do flow from the northeast, which can be interpreted as "north". Are these diverted into the Pacific Ocean? Alternatively, is there any other water coming from the north that is being diverted into the Pacific Ocean? Does California have "vast amounts of water coming from the North", "being diverted into the Pacific Ocean"? The implied claim that these supposed diversions are in any way hindering firefighting in the region, has already been addressed elsewhere. Not an authoritative source , just a blogger, but a decent attempt to explain some of the cali water issues that's reasonably well sourced itself. 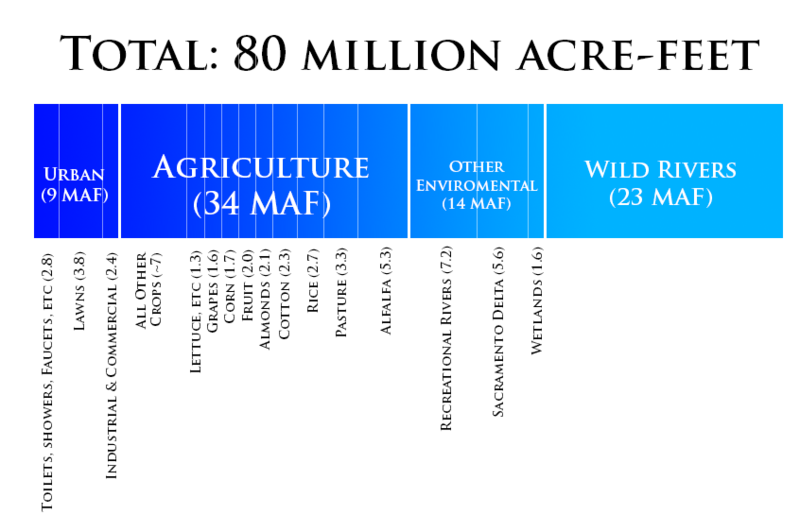 California receives a total of 80 million acre-feet [99 km³] of water per year. Of those, 23 million [28 km³] are stuck in wild rivers (the hydrological phenomenon, not the theme park). These aren’t dammed and don’t have aqueducts to them so they can’t be used for other things. It may depend on what you consider diverted to mean, if you only count when you divert water out of a river and into an aqueduct then release it somewhere else like into another river or wetlands that eventually sees it enter the ocean then this only seems to happen to a relatively small amount of water. If you count water that you could easily divert at the press of a button to other uses like agriculture but instead allow to remain in the rivers flowing into the ocean then a larger fraction would count. If you use a very broad version where you count overarching political choices about where to build dams and aqueducts and choices about economy vs ecosystem (which I believe would be an unreasonably broad interpreation) then you might count most fresh water that you allow to flow into the ocean. Even the strict interpretation where you only count actual physical diversions include a few percent of cali's water which is a lot of water in absolute terms or relative to cali urban use. Not the answer you're looking for? Browse other questions tagged united-states water ecology .